Life Between Pages: I'm sorry Gatsby, but I have no desire to meet you right now. I'm sorry Gatsby, but I have no desire to meet you right now. What do you do when you start reading a book, get a couple of dozen pages or so in, but find yourself completely uninterested and disconnected? If you're anything like me, you'll put the book to one side and quickly pick up something else. I am probably the most impatient person that I know. Countless times have I stopped reading books because of my constant need to be entertained quickly; no patience to see them through, to see if they get better later on. So this is the reason why I'm giving up on The Great Gatsby only 30 pages into the story. I know this is supposed to be 'one of the greatest American novels of all time', but as of now I can't see that. It's not even a long book; it's 144 pages long and I've only been reading it 2 days, but I'm just. so. bored! Sure, the writing is poetic, the 1920s era in which it is written is interesting, but for me there is nothing beyond that. There are going to be many who disagree with my opinion and will say, 'how can you come to such a conclusion when you're not even half way through'? Well, for a book that's 144 pages long, I'm finding that it's slow, it's tedious, and I just plain as day don't get it. So for now, I'm putting it back on the shelf for another time when my patience has grown. 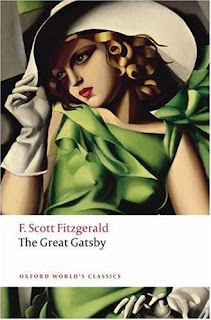 Perhaps we'll meet another time, Gatsby.